Vince and I sleep late—around 2 or 3 a.m. is the usual time we turn the lights out. After we get home from work, we play with the rabbits, we have dinner late, and have a long drawn out affair of talking about the day, the next day, and stuff we read about in the news or in the books on our bedside table. Then it's TV marathon time or a movie even, then feed the wabbits time, then sometimes dessert time. Then Vince cleans the kitchen (I cooked, you see) and it's his habit to put on our little blue kettle and brew some iced tea for breakfast. Yep, we like making our own iced tea instead of relying on the convenient powdered ones. We have many kinds of tea at home. For hot teas, we have this... I really don't know what it is because the packaging is Japanese but it looks like dried grass and rice crispies and it's so good and toasty and full-bodied. Perfect for an after-meal drink. I also have this medicinal herbal tea that I only drink when I'm feeling ill. The rest of our teas we like cold. 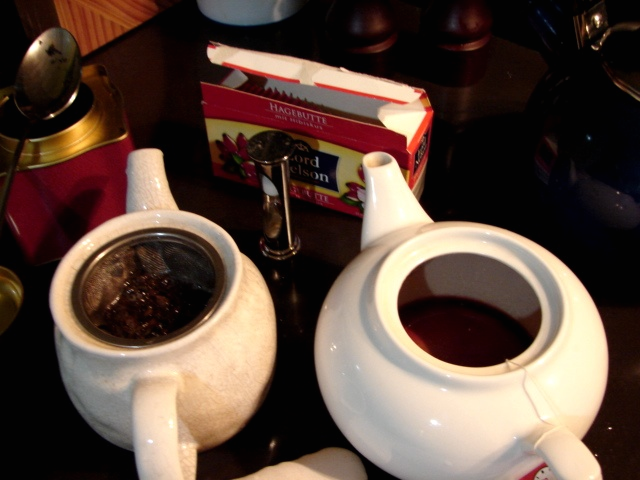 So Vince brews dried black tea leaves in one pot and cranberry infusion in another pot. Then as we wait for the water to cool, Vince goes to the library to write while I go to the bedroom to blog or write or read. The water usually takes an hour or so to get down to room temperature, whereupon Vince transfers the cranberry infusion to a pitcher and the black tea to a flask then off inside the fridge they go. In the morning, they're super duper cold and refreshing! And that's your peek into our bedtime ritual. Now I'm off to read Philip Pullman's The Golden Compass. Good night! UPDATE: The wonderful Bucca just told me that the Japanese tea Vince and I enjoy so is called Genmaicha. Thanks, Bucca! You're a sweetheart! What a nice bedtime ritual :) It sound very relaxing! Oh that Japanese tea you like is called Genmaicha (brown rice and green tea). It's delicious I love it! Tani, milk tea is sooo heartwarming =D We should have a tea date! Dana, yes, it's such a relaxing ritual. But there's a lot of pots to wash after! Bucca, thanks for telling me!!! eMz, I'm in the thick of it! Exciting! I only have the first book, though.